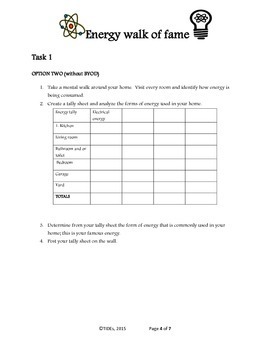 All about energy bundle comprises of fun project and activities that get students moving, interacting with different media and collaborating with classmates. 1. Amazing Heat: Students will apply the knowledge of thermal energy transfer and heat technology as they research and prepare their product. The activity provides a practical and interesting strategy of learning forms and transformation of energy and uses in the community. 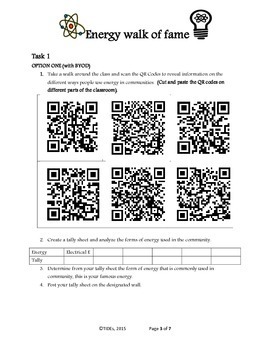 In classes participating in BYOD (Bring Your Own Device) students are able to walk around and scan QR codes on the wall, read the information and watch videos. During the activity students will explain how energy is converted from one form to other using items in their home and community. They will also categorize various forms of energy as kinetic or potential energy. Students are prompted to apply their math skills by creating tally sheets. The tally sheets are used as data collecting instruments. 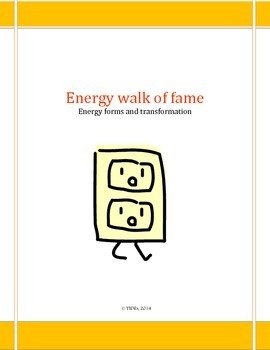 The final walk round the class enables students to make a conclusion on the most "famous" (mostly used) energy in the community. a. 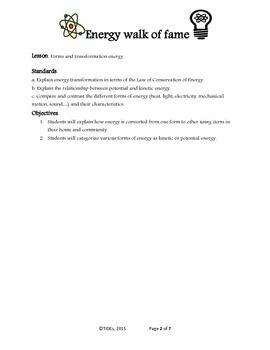 Explain energy transformation in terms of the Law of Conservation of Energy. c. Compare and contrast the different forms of energy (heat, light, electricity, mechanical motion, sound) and their characteristics. Energy walk of fame by TIDEs is licensed under a Creative Commons Attribution-NonCommercial-ShareAlike 3.0 Unported License. Based on a work at http://www.tidesinc.org/. Permissions beyond the scope of this license may be available at http://www.tidesinc.org/contact/.